(Newser) – More bad news for Mitt Romney's biggest donor: US federal authorities are investigating Sheldon Adelson's Las Vegas Sands Corp. for possible violation of American anti-bribery laws in deals it made in China, the Wall Street Journal finds. The probe is separate from the investigation into alleged money laundering at Sands casinos, and goes beyond bribery allegations made in a wrongful dismissal suit from the former chief of Adelson's Macau operations. Sands' own audit committee is also investigating the deals. Don't sweat it. 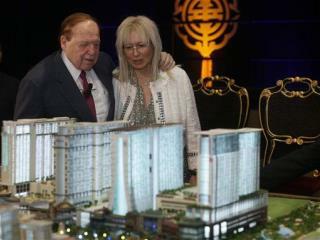 Republicans can pass laws retroactively to make anything Adelson has done become legal. And why aren't those same U.S. Federal authorities doing any investigation of Jon Corzine who allegedly stole $1.6 billion from innocent investors to protect MF Global? Oh, that's right, he's a top Democrat. Anyone not supporting Obama probably should expect an IRS audit. And this is the guy who's funding Willard's campaign, eh? So if Willie gets elected he'll drag us into a war with Iran just to appease a corrupt casino magnate who's outsourcing jobs to China. Swell..